Outside Wood from the Hood’s main office on Minnehaha Avenue and 26th Street in Minneapolis sits a small red dumpster with “free” spray-painted in blaze orange on the side. Instead of meeting the woodchipper, the wood scraps inside provide local woodworkers and hobbyists with an otherwise costly bounty. One neighbor uses the scraps to carve toys for charities. Other tenacious neighbors walk into the office and ask about the next load. 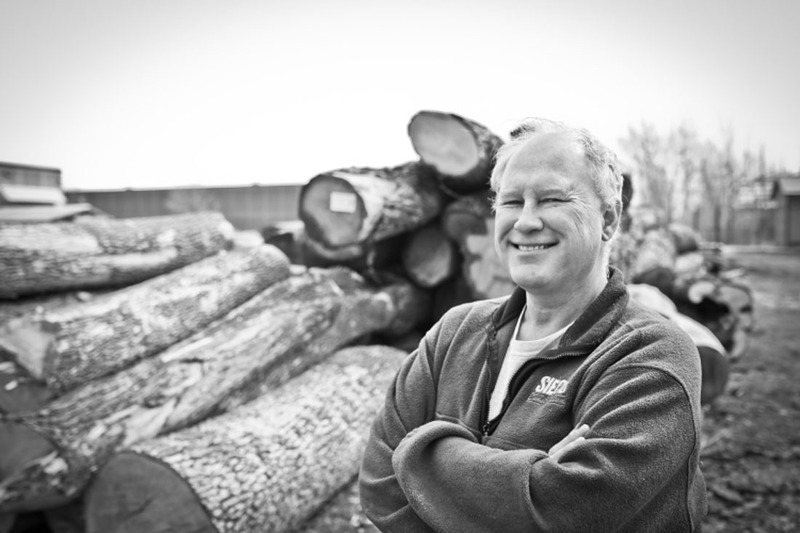 Jon Buck, Wood from the Hood’s custom design manager, says he often sees people load up every spare inch of their vehicle. 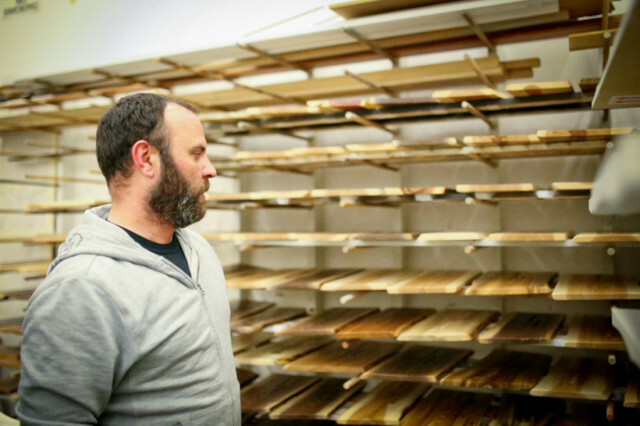 It’s just one of the many gestures that sets this local woodworking business apart. 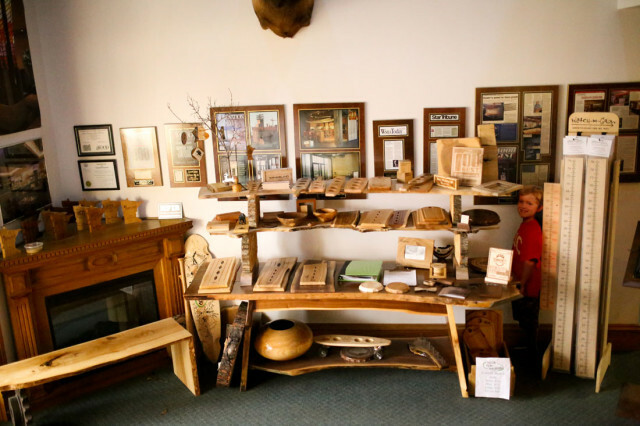 The company began from a simple idea, which came to Cindy and Rick Siewert as they watched an old ash tree in their yard being cut down. What if they could create a sustainable, local lumber supply and give downed urban trees a higher purpose than mulch or trash? The Siewerts saved the ash tree and engaged in a series of experiments in their cabinet shop, Siewert Cabinet and Fixture. 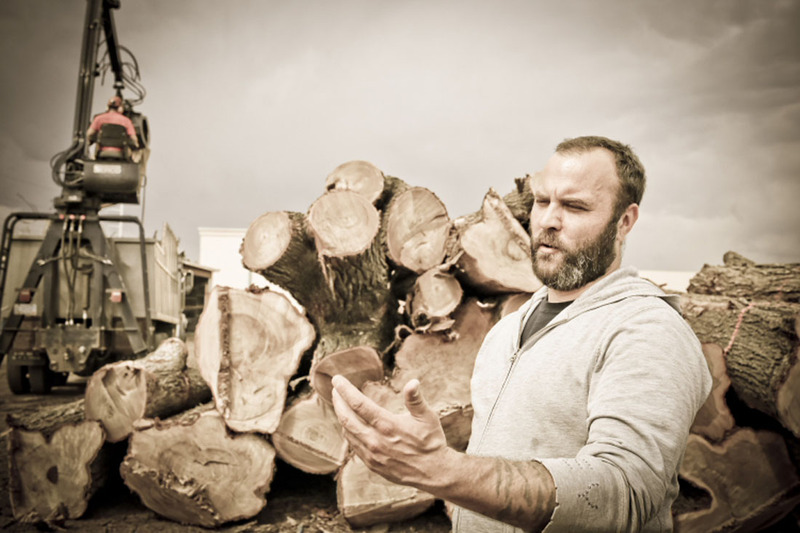 Over time, the higher purpose for the reclaimed trees they sought took on many forms, from flooring to commercial-design work to dining-room tables. 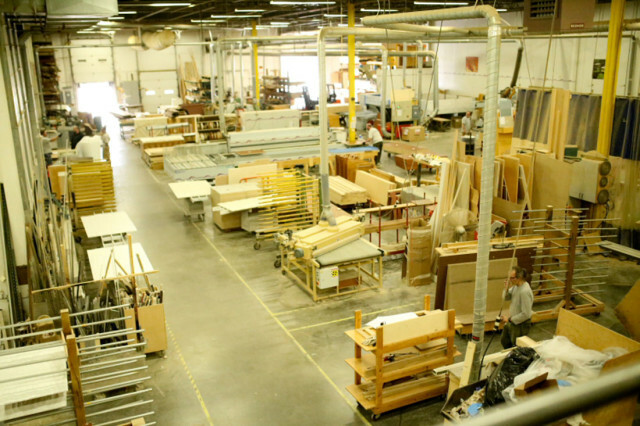 In 2008, after a year of trial and error of milling different species of trees in the cabinet shop to see what was more durable and aesthetically pleasing, Wood from the Hood officially began operations, receiving trees from private tree services and residences. After a few years of seeking partnership, the Minneapolis Park Board finally agreed to work with Wood from the Hood in January of 2011, allowing them to survey neighborhoods for city-marked, ill-fated trees and tag the ones they wanted to reclaim with blue dots. Flawlessness isn’t a criteria for Wood From the Hood trees—that’s a rare quality, typically only found in trees salvaged from golf courses. 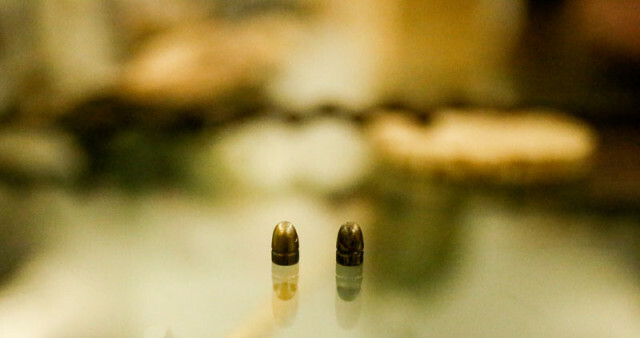 Instead, the company focuses more on finding the least-abused specimens. 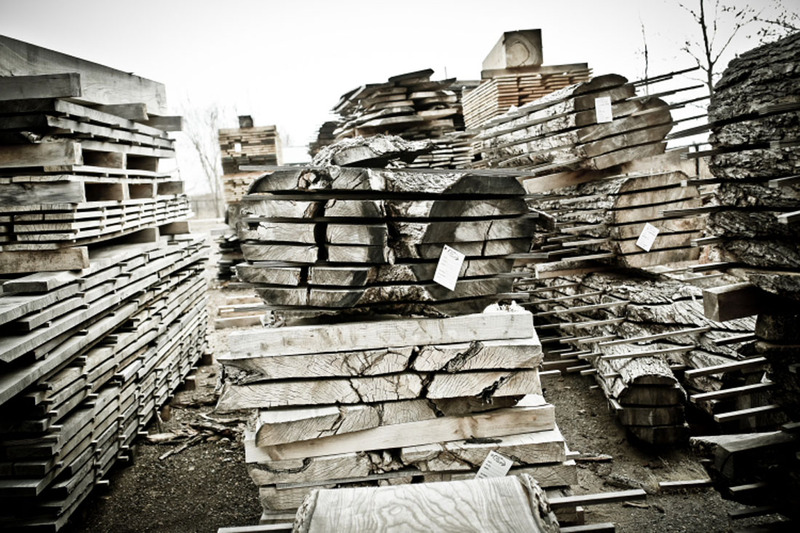 Eighty percent of the trees Wood from the Hood mills contain at least some metal, which can cause processing problems. 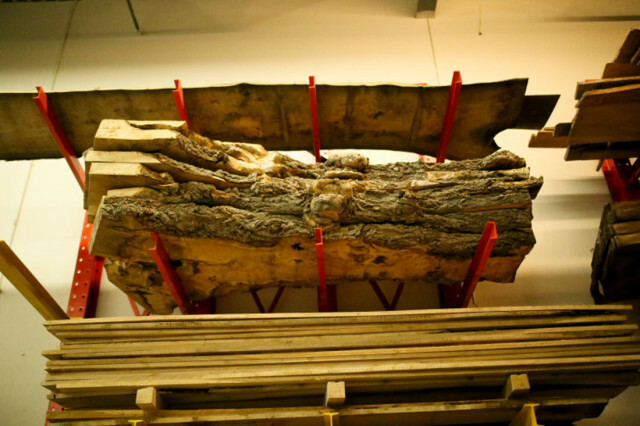 Beyond dulling and ruining the saw blades used to mill the tree into lumber, metal also presents aesthetic challenges for Wood from the Hood’s woodworkers. Some trees, like ash, have higher levels of tannic acid, which slightly corrodes the metal and leaves behind bluish-black bruises in the wood. Wood from the Hood picks their battles, cutting around the metal or leaving the bruising as a testament to the trees’ urban fingerprint. 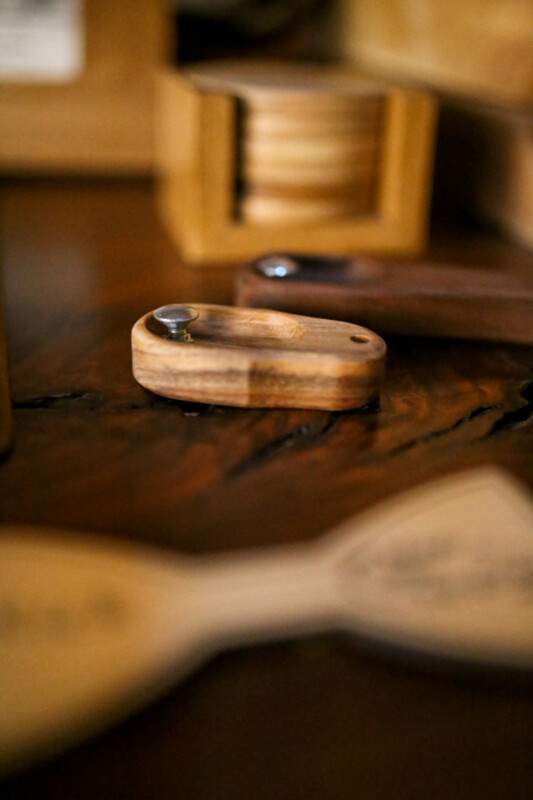 Without the luxury of picking any group of trees from a forest, Wood from the Hood is dependent on using only what’s marked for removal—which adds another element of individuality to their products. Ninety percent of Wood from the Hood’s supply comes from Minneapolis proper, but they’ll take trees from anywhere in the Metro. The mainstays in their repertoire have been American elm, ash, red oak, white oak, and walnut, but they’ve also experimented with other species. Buckthorn and apple don’t work for their purposes. Pine and other softwoods aren’t an option as it’s too difficult to compete with Home Depot or Lowe’s for the pine market. So that leaves them with hardwoods. When the emerald ash borer, a small, non-native, iridescent-green beetle responsible for killing millions of ash trees in North America, invaded local ash trees a few years ago, whole neighborhoods mourned as trees were cut down from yards and parks. Many of them weren’t yet afflicted with the emerald ash borer, but were instead taken down as a preventative measure. In fact, of the trees salvaged during this time, Wood from the Hood hasn’t processed a single one that has physical evidence of an actual ash borer. But diseased trees also yield good lumber: the insect’s larvae only affect the delicate layer between the inner bark and the wood, known as the cambium layer. Upstairs in the office, Jon and Rick show off a recently felled box elder tree from Plymouth that will someday become a sleek table. It’s draped in an L-shape over the product-sample cabinet with the wood grain perfectly bookmatched. Jagged lines of black etchings run along one side of the wood, zig-zagging like the results of a failed polygraph test. “This is called spalting,” Jon explains. 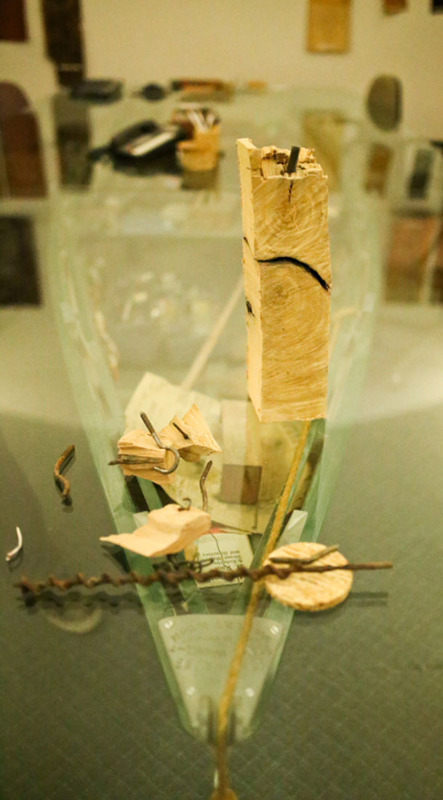 “It occurs when microorganisms feed on the wood. The heating process kills the microorganisms and freezes them in a state of decay. Different species spalt differently, and every microclimate has particular organisms floating around.” He points to one of the 30 panels on what they call the trophy wall—a wall of 30 successfully milled species. One of the samples, taken from a tree on Macalester College’s campus, boasts a funky pattern of ink-like lines stretching in every direction. The result is something that looks like a cross between zebrawood and ash. “People ask for it, but it’s luck of the draw,” Jon says. Downstairs and through a doorway is a set of stairs leading to the company’s 40,000-square-foot warehouse, AC/DC blaring from the stereo over the echoes of buzzing saws and air compressors. There are a dozen workers sanding, painting, staining, loading, and unloading vans full of lumber. Rick and Jon point out a table in progress of being made from a beautiful, husky oak that came from the client’s backyard. Splotches of epoxy resin—skim coating to fill cracks and knots—speckle the top. After that dries, they’ll put a finish on it. Forty-five to 50 hours goes into the average dining table. Wood from the Hood does in-house design work for projects like these, but for more commercial architectural projects they work with an outside designer. Though their business is dependent on what’s available, Rick and Jon emphasize that they don’t accept just any dropped tree on the block. Their mission, after all, is to create a product people can’t get at big-box stores. To accomplish that, they need to be choosy with their wood; creativity, rather than convenience, is key. Beyond the piles of lumber in the backyard, on the other side of a fence, cyclers whoosh past on the Midtown Greenway. Jon says Wood from the Hood is thinking about turning the fence line into a community hops garden. It’s just one more example of how the company contributes to its ’hood. Most of their sawdust already goes to Mississippi Mushrooms, a Northeast Minneapolis urban-agriculture business that combines the dust with spent grain from Dangerous Man Brewing and uses it as food for the mushrooms. Having the tree from your childhood backyard chopped down can be startlingly disheartening, like losing an old friend. 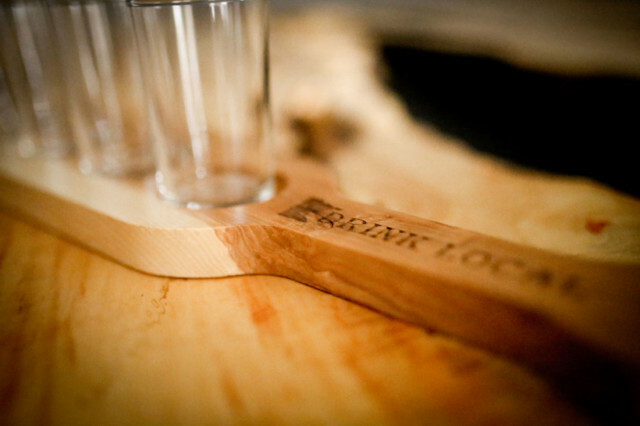 But whether it’s a cribbage board, a bottle opener, a picture frame, or a growth chart, Wood from the Hood is accomplishing its mission of giving those trees a new shape and purpose, one handcrafted project at a time. With a burgeoning pedigree of products currently sold at 28 retailers around the Twin Cities, including Seward Co-op and the Mill City Museum, and some dazzling custom work now on display at Surly’s new taproom, you may find yourself getting reacquainted with that old elm you climbed as a kid.